The dream ended last night for 17-year-old tennis star Melanie Oudin, who lost in straight sets to Caroline Wozniacki at the U.S. Open. Oudin joined John Roberts and Carol Costello on CNN’s “American Morning” Thursday to talk about her incredible run. An edited transcript of the interview is below. John Roberts: Last year was your first U.S. Open appearance. You came in as a wild card. You were out in the first round. What was this year's experience compared to last? Melanie Oudin: It was so much better. I wanted to get revenge this year, because it was very disappointing losing last year first round. Roberts: Yeah, you'd been pro for all of four months…what the heck? Oudin: Yeah. I did much better. And I’m really proud of myself for how I did. Carol Costello: You were saying before it was a combination of everything that maybe affected your game. Tell us about that, what the pressure has been like on you, with all of the attention that you're getting. Oudin: It's been hard. It's definitely different than what I'm used to. I'm just used to going out and playing tennis, but these two weeks have been so much more than that. It’s been lots of media and lots of different things happening and people knowing who I am now and just a lot of things, but all in all, it was good for me and it’s a good learning experience. 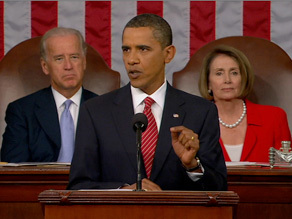 President Obama laid out his plan for health care reform in a prime-time speech to Congress last night. How's it playing with rank-and-file Americans? Our Jim Acosta watched the speech with a group of Virginia residents who put the president to the "dial test." Tomorrow is September 11 – an important time to ask tough questions like this one: Could terrorists get their hands on a weapon that could do even more damage and smuggle it into the US? CNN's Paula Newton reports in part two of our special series, "Spies Among Us." WASHINGTON (CNN) - A Republican House member shouted "You lie" during President Obama's health care speech to Congress on Wednesday, and members of both parties condemned the heckling. 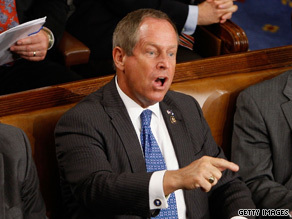 Rep. Joe Wilson shouted ''You lie'' after President Obama denied health reform would cover illegal immigrants. The outburst came when Obama denied that proposed health care legislation would provide free health coverage for illegal immigrants. Immediately, Wilson shouted, "You lie!" President Obama selling his health care plan, in a make or break speech to congress, and more importantly to the American people. 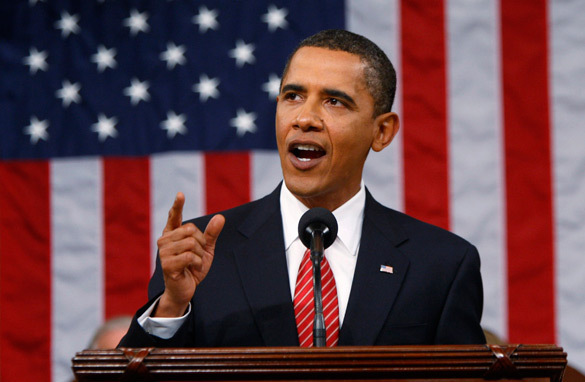 The president kept the public option on the table and called on lawmakers to work together. But one yelled out that he was a liar in the middle of his speech. Today, whether he could be censured for the outburst. And whether you went to bed last night with a better understanding of what this is all about? The entire AM team is breaking everything down for you this morning. We have reaction from both sides, including former New York Mayor Rudy Giuliani. It's Bernie Madoff in his own words, telling colleagues how to dance around questions from the SEC. In a just-released audio recording from 2005, the convicted swindler is heard coaching a potential witness about fooling regulators, saying "you don't have to be too brilliant" to get away with it. And wait ‘till you hear the rest. Tennis phenom Melanie Oudin's sensational U.S open run is over. Number 9 seed Caroline Wozniacki of Denmark defeated the 17-year-old American, 6-2, 6-2. The teen tennis star apparently never expected to get as far as she did. Her hotel reservation ran out mid week and she had to pack up and move to the hotel next door. Oudin will be with us live to talk about her amazing ride. WASHINGTON (CNN) - President Obama told Congress on Wednesday that while he is not the first president to take up the cause of health care reform, "I am determined to be the last." President Obama told a joint session of Congress that the 'time for bickering' over health care is over. In an address to a joint session of Congres Obama presented the most detailed description of his idea of health reform, and at the same time posted an outline of his plan on the White House Web site. Obama has been criticized as the health care debate has devolved into rancorous town hall meetings and a partisan split over reform plans. Obama has also faced a split in his own party over how to best go about reforming the nation's health care system. What is your reaction to the speech? What do you think of the president's plan? Add a comment below.